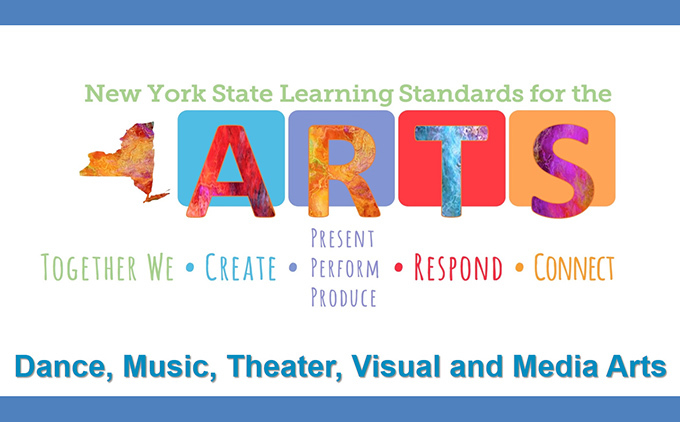 The 2017 New York State P-12 Learning Standards for the Arts are designed to develop artistically literate citizens. An artistically literate citizen has the knowledge, skills, and understanding to actively engage in the arts throughout their lives. The intrinsic nature of the arts leads to and promotes a civilized, sustainable society. Artistically literate graduates are career and college ready, capable of understanding and addressing the needs of society, and participating in a global economy. Through creating, performing, responding, and connecting in the arts, students generate experiences, construct knowledge, and build a more integrated understanding of self and community. They explore and express ideas, feelings, and beliefs about the past and present; discover new ideas; and begin to envision possible futures. Through careful study of their own and others’ art, students explore and make sense of the broad human condition across time and cultures.